TORONTO (Feb. 13) — During this mostly–refreshing season for fans of the Toronto Maple Leafs, the club has been gazing upward at its Atlantic Division rivals; aiming for a top–three finish and a guaranteed playoff berth in the Eastern Conference. 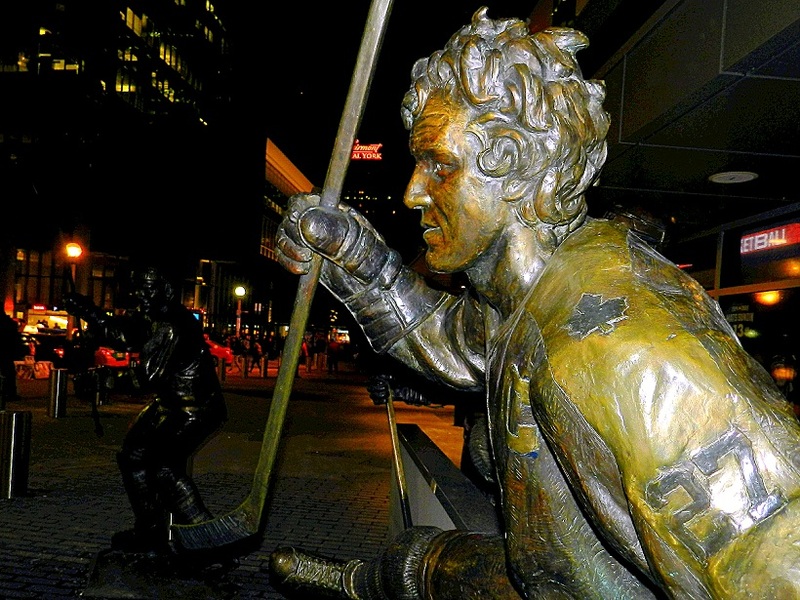 The Ottawa Senators and Boston Bruins have stood well within “catching” distance for much of the schedule. 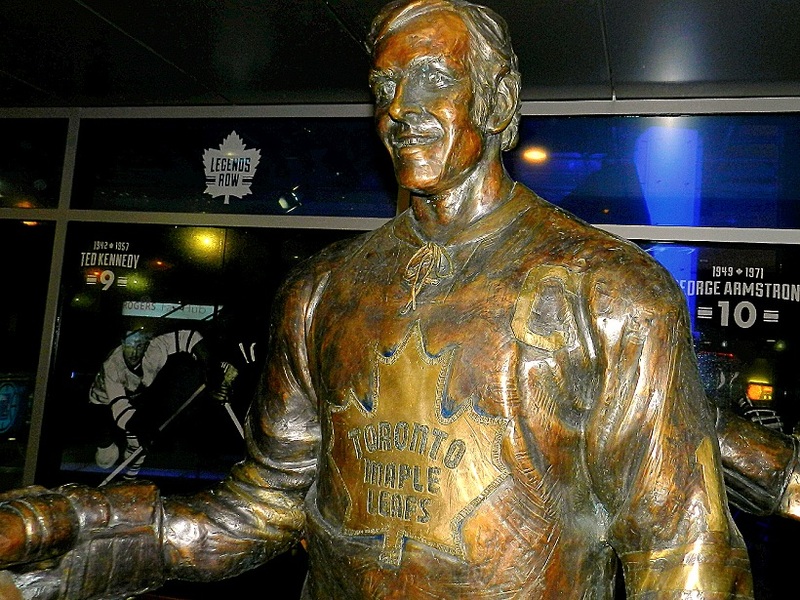 And, a wild–card invitation to the Stanley Cup tournament belonged to the Maple Leafs, even after a regulation–time loss to Buffalo at the Air Canada Centre on Saturday night. Suddenly, however, there is traffic in the rear–view mirror. The new week began with the Leafs holding the No. 2 wild–card position, having accrued 61 points in 54 games. If the playoffs began tonight, Toronto would open a best–of–seven Conference quarterfinal at the Verizon Center in Washington. Within breathing distance, however, is virtually every non–playoff team in the East. 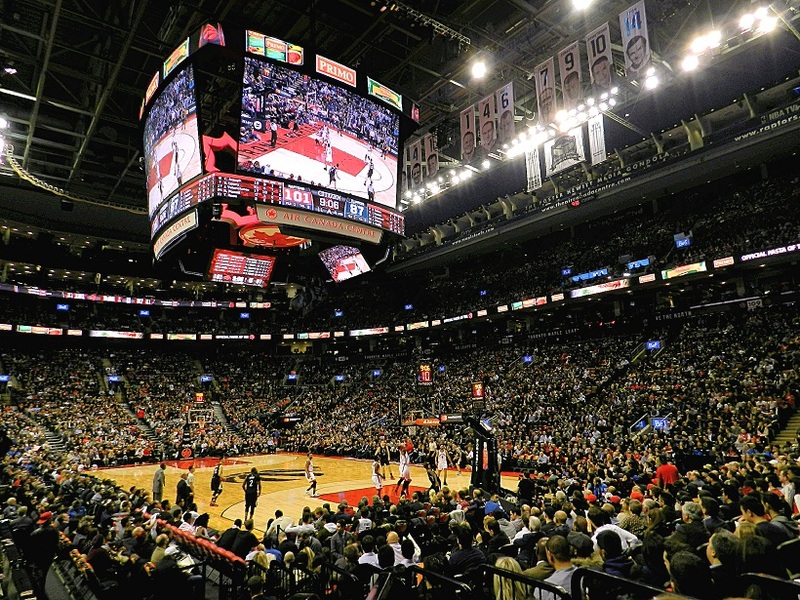 Only seven points separates Toronto from last–place Detroit. Also with 61 points are the Philadelphia Flyers — out of the playoffs at the moment by virtue of the Leafs having two games–in–hand. The New York Islanders (60 points); Florida (58); Tampa Bay (57); New Jersey / Buffalo (56); Carolina (55) and Detroit (54) round out the Eastern playoff spectators. There could be lots of company for Toronto down the stretch. Please don’t construe this as a “glass–half–empty” appraisal of the Blue and White. It’s merely a warning. The Leafs are not playing poorly, but neither is the club blazing as it did in December and most of January. Toronto compiled an 11–4–4 record for 26 points between Dec. 3 and Jan. 17. In 12 games since Jan. 17, the Leafs are 4–5–3 — just enough of a flat–spot to bunch up the traffic–from–behind. As Leaf observers are aware, the club has been lamentable after 60 minutes, yielding 11 points in overtime and the shootout. Six of those points would have Toronto breathing down Montreal’s neck today for the Atlantic Division lead. 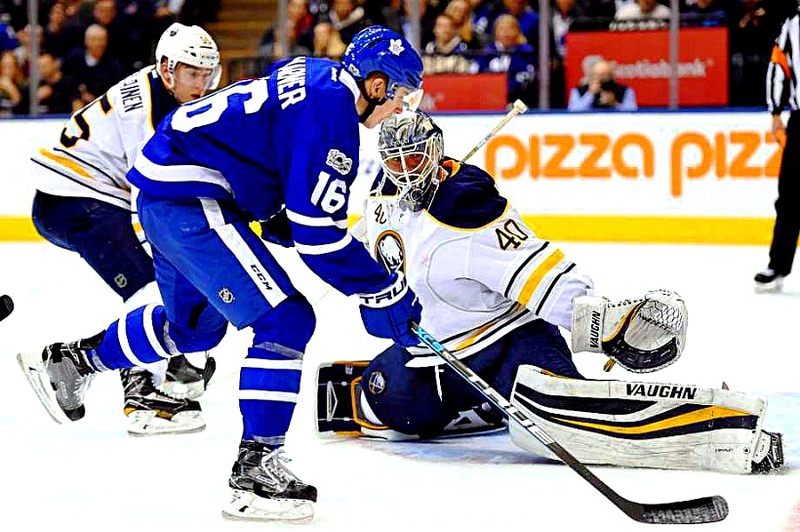 BUFFALO GOALIE ROBIN LEHNER STOPS MITCH MARNER FROM CLOSE IN ON SATURDAY NIGHT AT THE AIR CANADA CENTRE. THE LEAFS FELL BEHIND, 3–0, IN THE FIRST PERIOD AND LOST, 3–1. I do not, in any way, subscribe to the oft–mentioned theory that the Maple Leaf newbies will hit a wall down the stretch. Auston Matthews, Mitch Marner, William Nylander, Connor Brown, Zach Hyman and Co. continue to create scoring opportunities with their speed and tenacity. Games, however, become more of a slog as the schedule winds down and teams jockey for playoff rank. If anything — and I believe Mike Babcock would concur — the Leafs require a boost from their more seasoned players. And, of course, big–time stuff from Freddy Andersen, who needs nine more appearances to equal his career–high of 54 (with Anaheim) in 2014–15. It will be interesting to see if Babcock has confidence in No. 2 stopper Curtis McElhinney. Starting tomorrow, at home to the New York Islanders, the Maple Leafs play 10 games in 21 nights. McElhinney will be a factor, should the coach choose to spell Andersen more often down the stretch. As it stands on Mats Sundin’s 46th birthday, the Leafs are another hot streak from challenging for second place in the Atlantic — and, perhaps, taking a run at first–place Montreal. Of the Eastern teams currently in a playoff spot, the Canadiens have the worst record (3–6–1) over the past ten games. The Leafs are second–worst at 4–4–2. Should, however, the Leafs remain flat (or lapse into their familiar late–season tailspin), it won’t take much for the club to be overrun from behind. Perhaps by multiple opposition. Toronto’s perch, at the moment, is both inspiring and precarious. 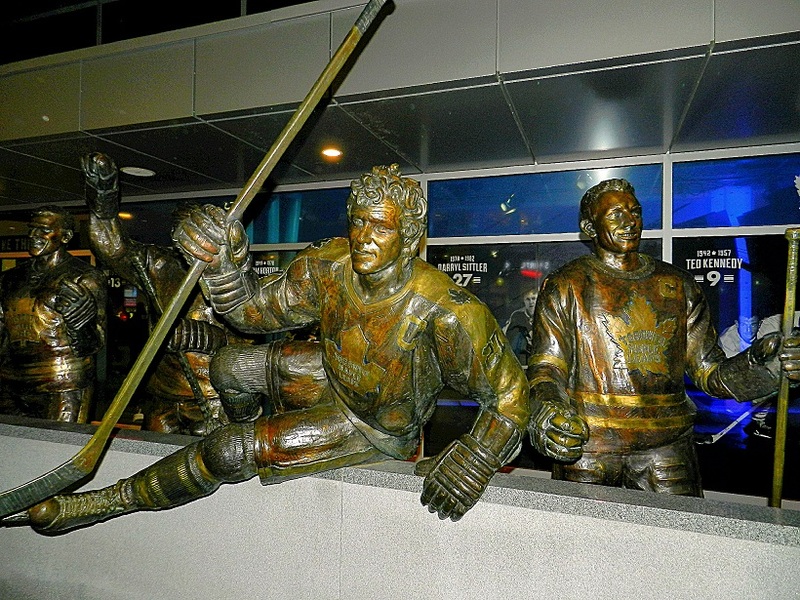 I went to a Toronto Raptors basketball game (above) at the Air Canada Centre last week and then walked over to the bronzed statues of the Maple Leafs Legends Row on the southwest plaza of the arena. DARRYL SITTLER — HOPPING OVER THE BOARDS. DAVE KEON. FINALLY IN HIS RIGHTFUL PLACE. 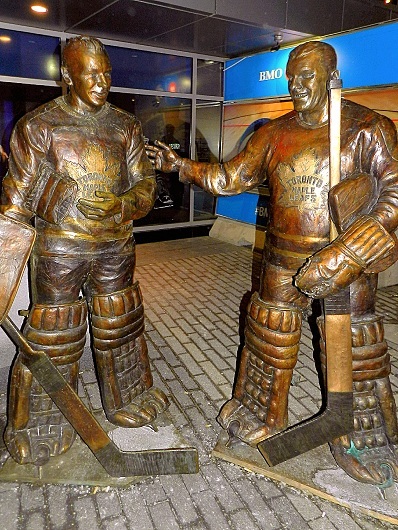 TOP–LEFT: GOALIES JOHNNY BOWER AND TURK BRODA. RIGHT: THE BIG SWEDE, MATS SUNDIN. 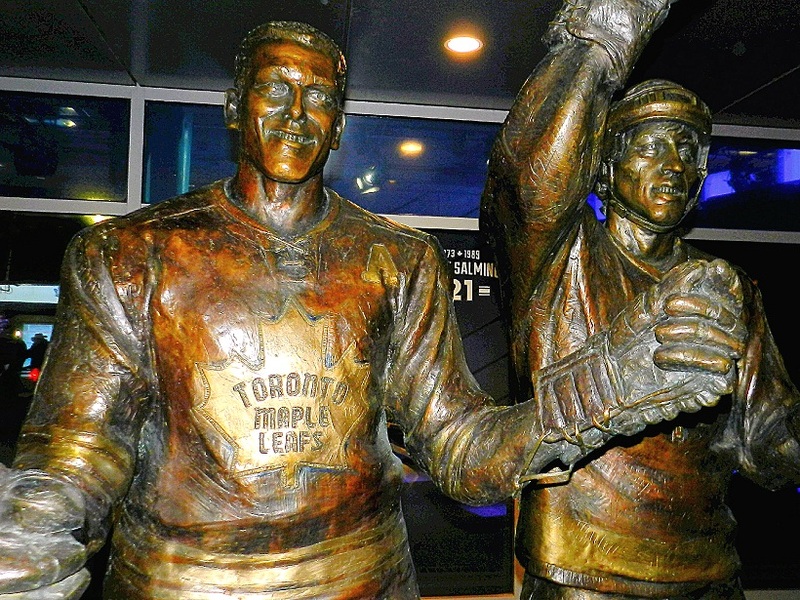 TIM HORTON (LEFT) AND BORJE SALMING — CONSIDERED THE LEAFS BEST–EVER DEFENSEMEN. DAVE KEON (LEFT) AND GEORGE ARMSTRONG. CAPTAINS ELITE. 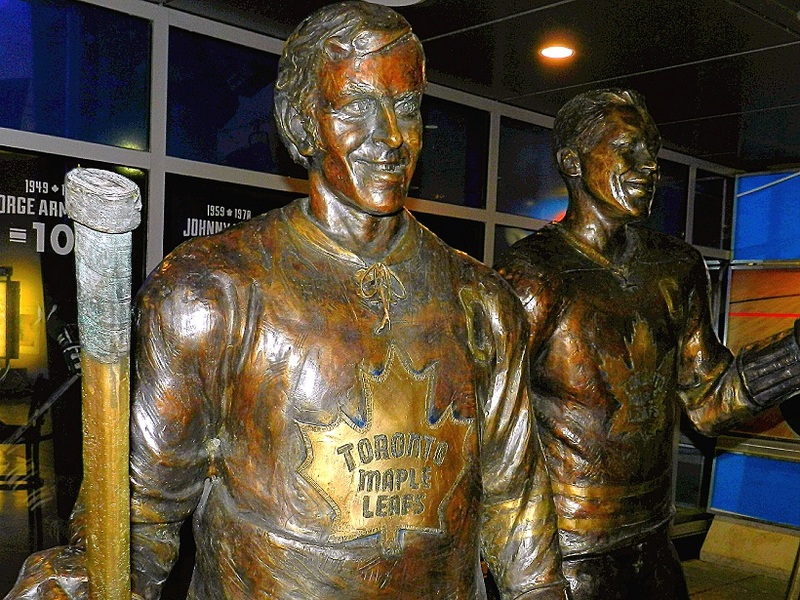 DARRYL SITTLER (LEFT) AND TEEDER KENNEDY. GREAT LEADERS, ON AND OFF THE ICE. 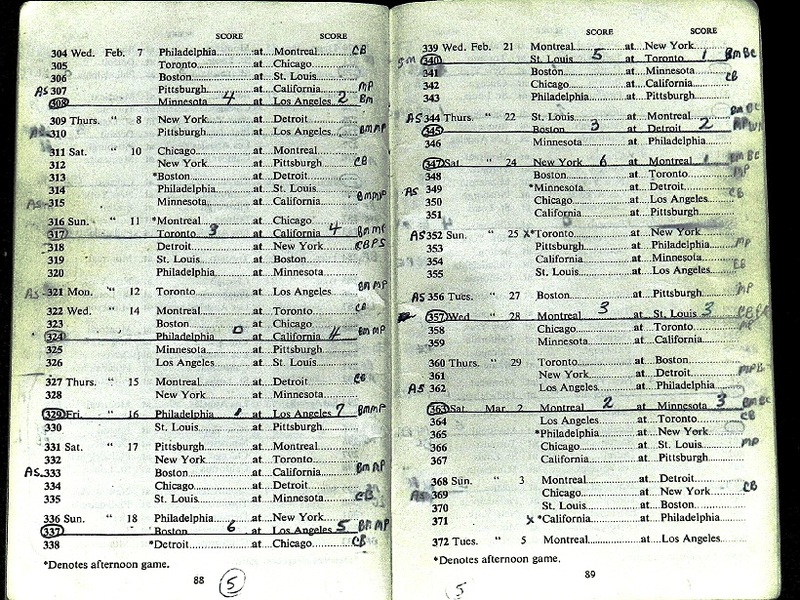 Many years ago, while working together on a project, former National Hockey League referee (1963–84) Bruce Hood loaned me his year–by–year officiating schedules from the 1960’s and early–70’s. 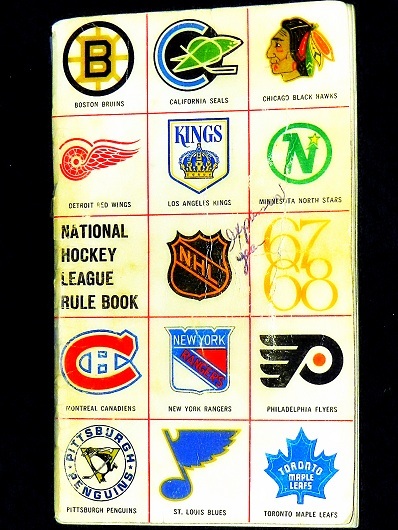 His games were noted (underlined) in the annual NHL rules booklet. My long–time pal, now 81 and retired, will be tickled to know that I found these “lost” items (pictured above) while digging through a box of material earlier today in my apartment locker. They will be returned to him, pronto–haste. 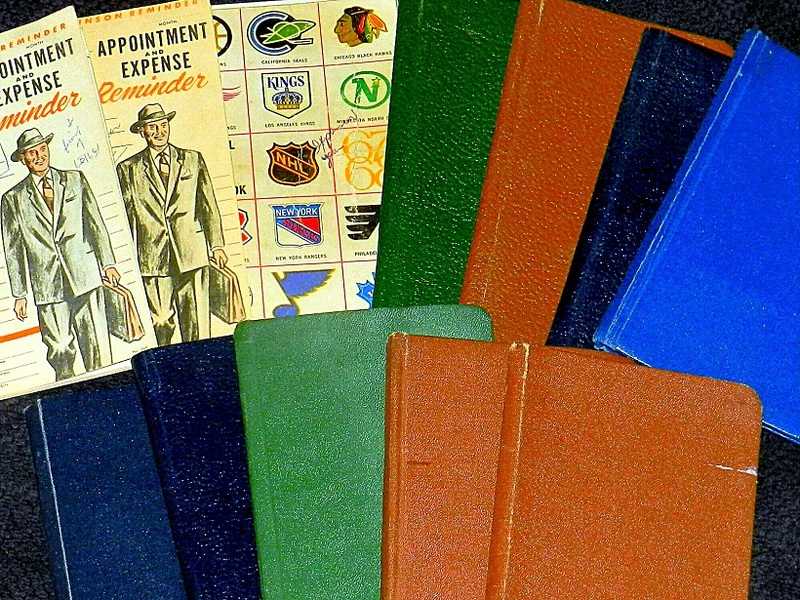 There is much history in these pocket–sized booklets. For example, Hood’s first full season as a referee in the NHL was 1967–68 — the year of the Great Expansion, when the league doubled to 12 teams by adding the California Seals, Los Angeles Kings, Minnesota North Stars, Philadelphia Flyers, Pittsburgh Penguins and St. Louis Blues. 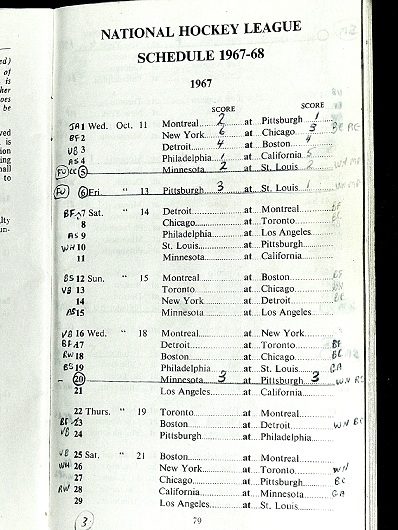 As noted in Bruce’s game–log (top–right), he worked the first–ever appearance of the Blues and North Stars (now the Dallas Stars) at the old St. Louis Arena on Oct. 11, 1967… then hung around to officiate the Penguins and Blues two nights later. On Oct. 18, 1967, he ref’ed the second–ever home game of the Penguins — against Minnesota at the Civic (later Mellon) Arena. 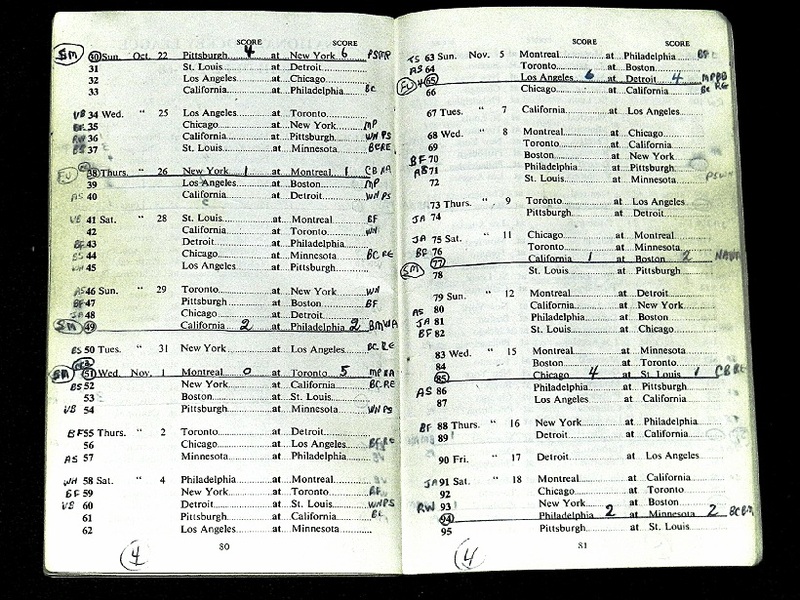 As October, 1967 morphed into November, Bruce worked the first home game of the New York Rangers against an expansion team (Oct. 22 vs. Pittsburgh at the old Madison Square Garden). 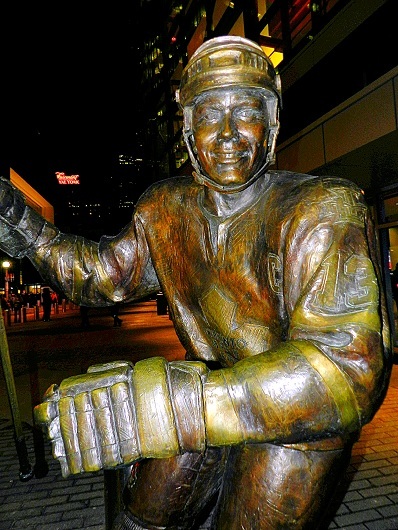 He was the referee at Maple Leaf Gardens on Nov. 1, 1967 when Johnny Bower blanked the Montreal Canadiens, 5–0. Bruce made his first trip to the west coast from Feb. 7–18, 1968 — refereeing three games in Los Angeles and two in Oakland (including the Maple Leafs and Seals, Nov. 11). On Feb. 28, at St. Louis, he officiated a preview of the 1968 Stanley Cup final between the Blues and Canadiens. The initials to the right of each game indicated the linesmen with whom he worked. “MP” is Matt Pavelich. “BM” is Bob Myers (later to become a referee). “BC” is Brent Casselman. “CB” is Claude Bechard. “PS” is Pat Shetler. “RE” is Ron Ego. “WN” is Willard Norris. “WA” is Walt Atanas. “EB” is Ed Butler. 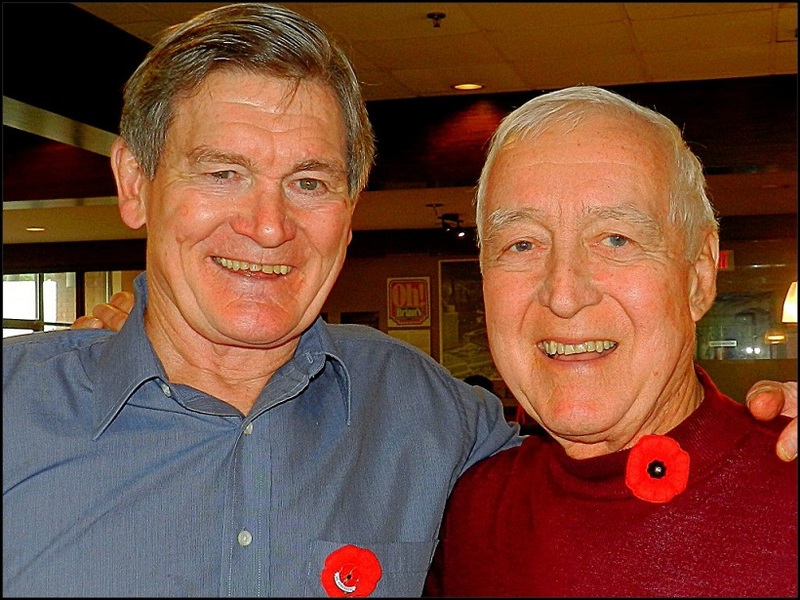 BRUCE HOOD (LEFT) POSED HERE IN 2013 WITH HIS BEST FRIEND IN HOCKEY — FELLOW NHL REFEREE RON WICKS — WHO DIED OF CANCER LAST APRIL.